I have a very specific Interest in Type D pommels, so the sword in Oakeshotts "Records of the medieval Sword" under Xa.13 really hit me. If anybody here had further informations on that sword-hilt-fragments from Copenhagen, that go beyond what Oakeshott has already written about it, I would be really happy.. Especially measurements and a picture of the side of the pommel would be great! Nationalmuseet doesn't seem to have any high resolution pictures online or other info about this sword (D8807). [I've tried]. 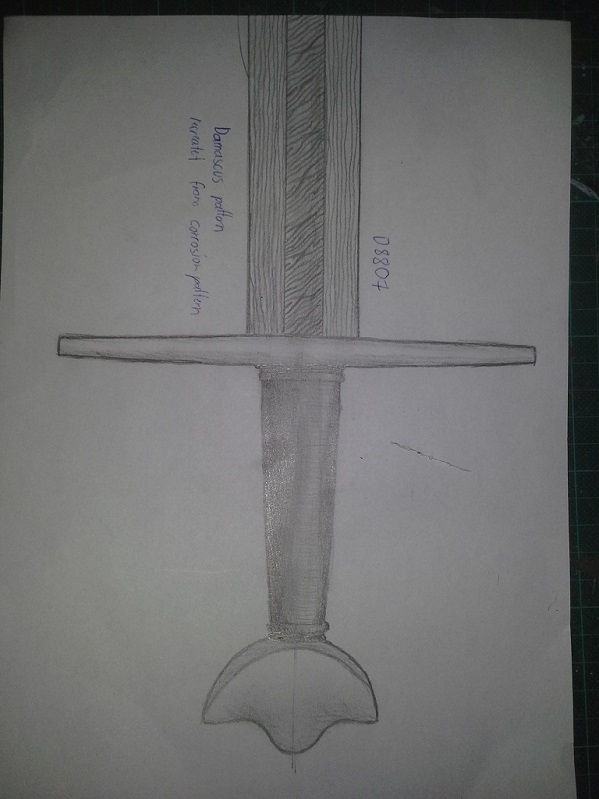 There is this my armory thread with a picture of the sword from the museum (on page 1), but it is a smaller picture of it, than the Oakeshott one you already have. From that Picture, in relation to the other weapons, it seems to have had a pretty long grip. The Danish sword collector E.A. Christensen had this sword, which where put on auction and according to Bonhams had a hilt comparable to D8807. Blade length is 95 cm and the sword is 108 cm in overall length. in red the tracing of the remaining Fragment and in blue my guessed original outlines. Direct comparison to the Hanwei Tinker Norman. The blade seems very narrow, especially for a possible dark ages blade. It may be far more gone than i estimated in my drawing. It is a very interesting sword if it is true it has an older refitted (late viking age?) blade. Hope some day someone gets a chance to look more into this blade fragment and write a paper on it. I have also noticed a slight confusion, when it comes to the use of term "damascus pattern". A viking sword was usually created by welding twisted rods of iron together and usually creating a "herringbone pattern", which is different from a Damascus (Damask) pattern. 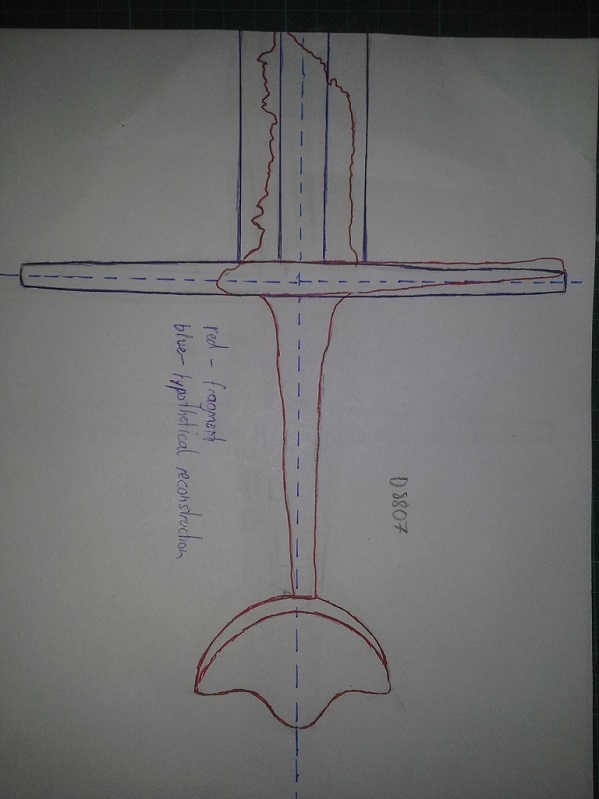 As pattern welded swords seems to have been invented in Europe (Celtic Iron Age), the term "Damascene sword" should then only be used for this "new" style of pattern, that was not seen in traditionally European pattern welded swords? Also the word only enters Europe (France as "Damas") in the 14th century, so it it first from this time, when the pattern is observed as something special. As I see it, the blade does look quite narrow, but is it possible to determine the original width of the blade by measuring (if possible) the slot in the guard? Also, the grip looks longer than "usual" for a viking sword (as previously mentioned). Could it be more of a later hybrid? Clearly I'm no expert, just curious. 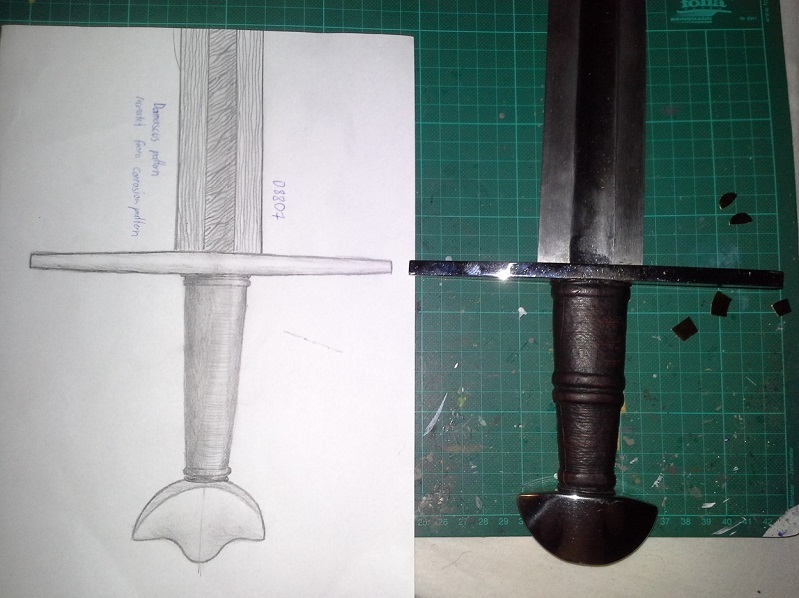 Also, the grip looks longer than "usual" for a viking sword (as previously mentioned). Could it be more of a later hybrid?. I do not think the hilt dates to the Viking age, the form of the pommel is exactly consistent with examples and illustrations dating towards 1200-1250 or so. The difference between these and Viking age "cocked hat" pommels (Petersen's type Y) can be subtle, but I think recognizable. Your reconstruction looks quite good! One caveat though, I would think that the apparent taper in the middle of the arms of the cross is deliberate and not the result of corrosion, so the cross would resemble a less dramatic version of the cross on Christensen's sword (ie. a type 2 cross vs. type 1). I think the blade is way to fragmented to really say something definite about the original width. Furthermore Type X blades were in use in the viking age, but perhaps you meant type Xa?.